"Mangrove forests are one of our most important and widespread coastal ecosystems. In Australia, mangrove forests occupy approximately 11,600 square kilometres of coastal foreshore and estuary areas, of which 4,600 square kilometres are in Queensland. These forests are vital to the biological productivity of Australia’s coastal waters. 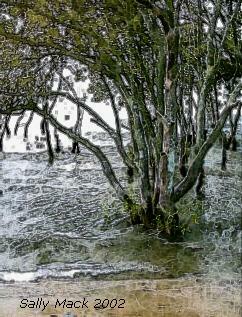 In recent years mangrove environments all around the world have come under increasing pressure from coastal development. Fortunately, Australia is one of the few countries with large areas of mangrove forests which have not yet been overexploited." from Australian Institute of Marine Science Field Guide to the Mangroves of Queensland. The Boondall Wetlands, found in the Brisbane suburb of Boondall contains a variety of ecosystems, sometimes called habitats, including mangroves. Click on the Environment link on the main page of the Boondall Wetlands site now part of the Pandora Archive. The Wetlands are managed by the Brisbane City Council.